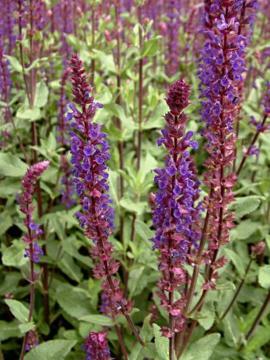 Erect, clump-forming, compact perennial with aromatic, notched, wrinkled, grey-green leaves and branching dark purple stems of deep indigo violet-blue flowers over a long period in summer. Sunny position and a light, well drained soil. Drought tolerant. By division or from cuttings. Good in hot, dry positions. Raised from a chance seedling by Beate Zillmer, of the Zillmer Nursery, Uchte, Germany.